Since I have to be a payments expert (see résumé as CEO of Wallaby), I spend a lot of time testing and playing with mobile payments. This means I have a couple of phones and every mobile wallet app oh which I know. 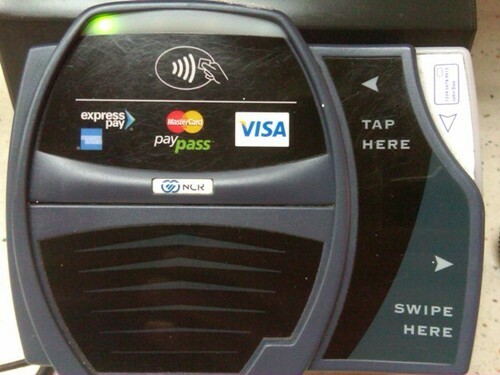 We’ve been curious to see how Google Wallet payments show up on different credit card statements, so the other day I took a trip to Jack in the Box, which has NFC (contactless) terminals at each of their locations (one of the few chains I know is consistent about this, but that’s another post). I ordered a soda and took out my Sprint Galaxy Nexus to pay with Google Wallet (one of the few phones with the capability). Then I was told the NFC terminal (similar to the one pictured here) wasn’t working and the cashier asked to swipe my card (which I wasn’t even holding yet). What if I didn’t have my wallet? No soda. This is the problem: Terminals get more complex and are more likely to break (especially consumer facing terminals). As long as there is a fallback payment mechanism, this terminal will probably just get ignored instead of fixed. Therefore, consumers like me are left with yet another impression that NFC isn’t ready and I should just leave my fancy phone at home anyway. In the past couple of months I have been asked to speak at a number of events around LA. I'm quite flattered to be asked and have noticed some themes in the questions.